Premiership leaders Players Lounge No.1 did not have a match this week giving their near rivals the chance to catch up a few points. Second placed Steelers Bar No.1 beat their No.5 team 4-1 but still trail by eleven points and have played a match more. Corner Pocket in third won 3-2 against Alpine No.1 and are a further two points back, but off the same number of matches as the Players, leaving much to do to mount any challenge. Both the top two sides in A division won 4-1, top placed Alpine No.2 against Lowood Club and second placed Laycocks Sports Club over Cueball Four. Consequently the Alpine preserve their six point lead over Laycocks. B division leaders Firth Park WMC lost 3-2 to second placed Allied Snooker Club No.3, moving the Allied side to within a point of them, but the Firth Park side have a match in hand. Allied Snooker Club No.1 and No.2, who hold those numbered places in C division went head to head. The No.1 team came out 3-2 winners to extend their lead to ten points. Colley WMC increased their lead at the top of D division to seven points with a 4-1 win at Back Club 88 while second placed Club Baize lost 3-2 at Allied Snooker Club No.4. Steelers Bar No.6 took top place off Stocksbridge Legionnaires, who did not have a match, in E division with a 4-1 win over Steelers Plaza. It puts them two points in front, but the Stocksbridge side have played a match less. Second placed Sheffield Deaf pulled off an excellent 5-0 win in E division at Crookes SC to close up a couple of points on leaders Spot On No.2 who beat their No.4 side 3-2. Spot On are the visitors at the Deaf Club in the next round of matches, but with a massive 19 lead and only five matches to go it could be the Deaf Club’s final tilt for the title. 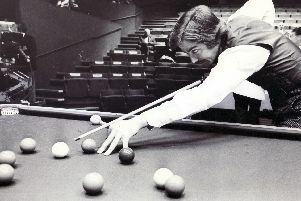 Five times Sheffield Champion Martin Finnigan made the highest break of the week with a 69 for Steelers Bar No.1 in the match mentioned above. In a good week for Sheffield Champions the current holder David Birley made a 52 and former holder David Allender 59. Other good breaks were made by Chris Butcher 54, Glen Jackson 35, Ant Ahmad and Danny Riley 34 each and Craig Allen 31.